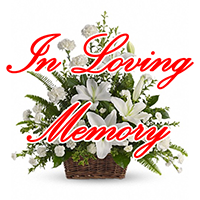 Georgia G. Scerbo, 86, of Melbourne, FL passed away on January 23, 2019. She was a retired school teacher a member of Ascension Catholic Church, an avid golfer, a volunteer at the King Center and played bridge at the Melbourne Senior Center at Wickham Park. Survivors include her daughters Theresa S. (Edward) Rusbosin and Suzanne (Craig) Chreene, sons Albert L. (Denise) Scerbo, Jr. and Mark (Christie) Scerbo, grandchildren, Albert, Mark, Mason, Noah and Gracie. She was predeceased by her husband Albert L. Scerbo, Sr.
Services will be held in Indiana, PA. Donations may be made to the charity of choice.